I’m obsessed with Monique Lhuillier’s Instagram account. Whether she’s posting fabulous vacation pics or promoting a new collection, her photos are always an exciting addition to my Insta-feed. 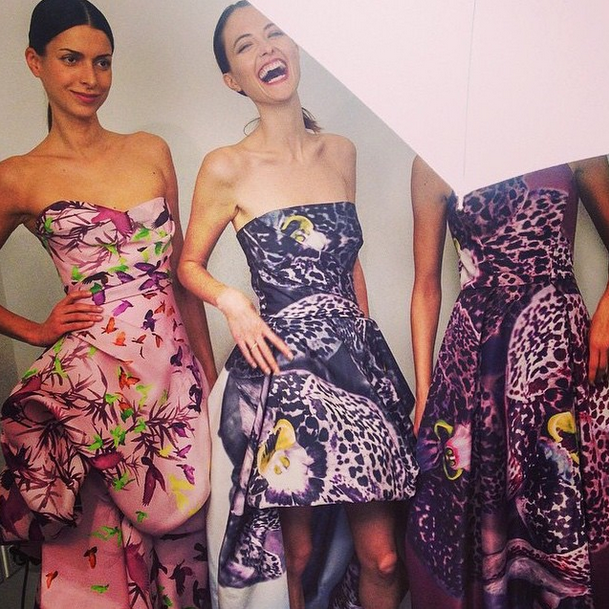 On Monday she posted a behind-the-scenes pic of models wearing her pre-fall 2015 collection–gorgeous silk gowns bursting with wild flowers and butterflies and coming alive with undulating folds of carefully crafted drapery. I saw this pic in the morning and honestly could not stop thinking about these dresses all day, daydreaming that I was sashaying around a black tie soirée in one of them. (Instead, I was at the office.) I’m still thinking about these dresses this morning, 5 days later… which is why this is my fave look of the week. To get inspired, follow @moniquelhuillier now.